Home / Sponsored / Holy Ghost Writer Another Rowling Pen Name? Holy Ghost Writer Another Rowling Pen Name? July 22, 2013	Sponsored Comments Off on Holy Ghost Writer Another Rowling Pen Name? 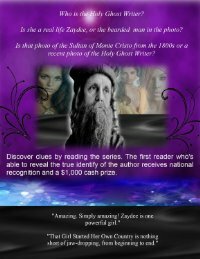 The holy ghost writer is a mysterious author offering a $2500 prize for the first to follow the clues that reveal his/her identity. Could this be Rowlings as well?